Using the name "Rakuno" for any character that isn't a ratonga is still something I still have very mixed feelings about. It is still a name that is heavily tied, in my mind, to my ratonga in Everquest 2 and imagining it being used for any other character ends up muddling those feelings. But alas, as I grow older I also grow lazier with names. That means ignoring my old philosophy of "new character, new name" and just recycling the few good names I have. So Rakuno it is for my asura. 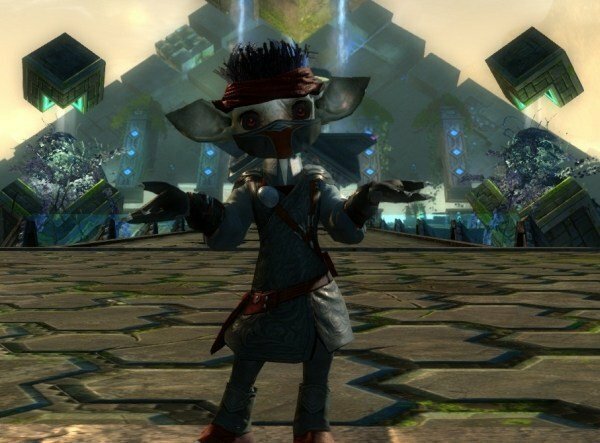 There is also another unfortunate side for giving this name to my asura, if you care about lore (which I do). See, in asura society it is tradition to have names with double letters. Those who have names that don't follow that tradition end up being mercilessly teased in school. And since Rakkuno or Raakuno, Rakunoo or any variation like that doesn't sound good in my head, Rakuno had to suffer with lots of teasing during his childhood. He already got over that a long time ago, probably just getting into thievery for fun and profit. That doesn't mean he won't try to exploit that past to his own gain. I am pretty sure he has a thesis all written up about the socio-economic impact and rise of criminality among asuran society due to that tradition. A thesis that will coincidentally be available to the public the moment he gets caught "borrowing" some items for his researches. Anyway, one thing about the thief profession that surprised me, now that the game has been officially released, is how much fun it is to fight with dual wielding daggers. Back during Beta Weekend 3 I just thought that kind of option was too squishy and not as fun as dual pistols. I am not sure what changed now, if it was just because I was craving for some melee goodness, if I just gave more thought on how to use the weapon skills with dual daggers or if there was some balance changes since then. Whatever the reason, I am just loving it. There is just something fun about being able to slice and dice your enemy in seconds and think of the best strategy on how to do that. I still carry a pair of pistols though as my secondary weapon set for those fights where going melee is just not a good idea. For utility skills, right now at level 20, I am going with Skale Venom, which adds Vulnerability and Weakness conditions to the enemy for five attacks. The drawback of that one is that it doesn't work with pistols so if I go ranged I feel a little gimped. The other two are: Signet of Agility and Caltrops. Signet of Agility is a passive that grants increased precision. It can also be activated to refill endurance and cure a condition for myself and nearby allies. Caltrops do what you expect of it, the thief throws some caltrops that will cause bleeding and slow down enemies who will walk over it. I chose these two as a question of flexibility, something that could be useful both in melee and ranged. So far it has been working well. I still don't have enough skill points to buy tier 3 skills so my setup will most likely change after I buy some of those. Traits were the hardest part to figure out. Almost every trait seemed useful to a dagger-using thief. After giving it some thought, I decided to go the traditional thief way and go for a poison/stealth build. Serpent's Touch (applies poison to the enemy when stealing) is very nice since I have been using the "Steal" ability as a quick way to get close to the enemy as well as using the stolen item to my advantage. With the addition of poison it becomes a good opening. For the first Major Trait I am going with "Venomous Strength" which makes venoms give 2 stacks of might for 20 seconds. Still need to test it out though as Rakuno just got to 20 and haven't really gotten out to fight much yet. Next will be to spend some points in the Shadow Arts since its Major Traits seems to really complement the use of venoms. The only thing I found sad is that my choice of mentor during character creation doesn't seem to make much of a difference for the story. My hope is that I am wrong about this and eventually this choice will play a bigger part in my personal storyline. But we'll see! Well, that should be it for my characters for now. I made a couple more already (ranger and necromancer) but not sure yet if I will write about them. We'll see! For now, back to Guild Wars 2 for me! Rakoono? I've always read "Rakuno" with the "u" as a "oo" sound anyway... though that may be wrong. Guess so. I just don't trust myself much with it because I have a tendency to pronounce words my own way even with common words and names. Only to realize that when someone points it out or I realize they pronounce it in a different way. Again, that happens with every language I try to speak, even my native one! Hm. That isn't a bad idea but I have an even better one! I could just name him xXxRakunoxXx then it would be appropriate (technically) and make everyone else facepalm at the same time!